Although daily brushing of teeth has become a cultural norm in North America, its history as part of a daily hygiene routine is surprisingly recent. In fact, it is only since the end of the Second World War that brushing on a daily basis has been adopted by the masses. 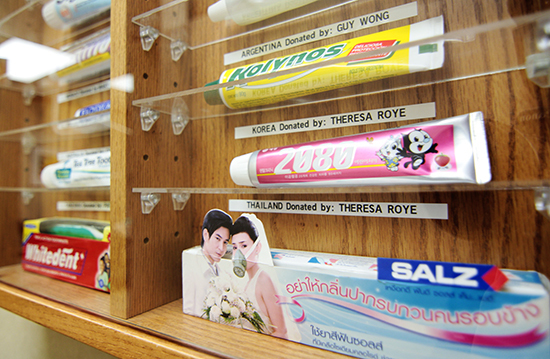 Some of the global toothpaste tubes in Dr. Allan Katchky’s collection. In other cultures, however, the medicinal and health benefits of toothpaste have been recognized for centuries. Ancient civilizations in China, India and Egypt all had their own ‘recipes’ for toothpaste, some dating as far back as 6,000 years ago. The Chinese were the first to recognize the anti-bacterial effect of salt, and incorporated crushed salt as the active ingredient in their toothpaste. Egyptians were the first to incorporate mint flavor in toothpaste, adding wet mint leaves to their paste almost 2,000 years ago. These early toothpastes predated toothbrushes by many centuries, and were either applied by hand or with a twig or leaf. In North America, the first commercially produced toothpaste was introduced in 1873 by Colgate. It was sold in a jar, and was not a huge commercial success. In 1892, a dentist named Dr. Washington Sheffield became the first to put toothpaste in a collapsible tube. Although novel, this concept did not gain traction for many years. Fluoride was first added to toothpaste in 1914, and very rapidly became the standard in North America. In more recent years, fluoride as an additive has become more controversial. In 1975, Tom’s of Maine became the first commercially available toothpaste brand to offer a non-fluoride alternative. Today there are over 20 brands of toothpaste with no fluoride added. Mint has certainly become the flavouring of choice for toothpaste in North America. However, there are also some ‘unique’ flavours for the more adventurous consumers of oral hygiene products, including cinnamon, chocolate, cupcake, bacon and wasabi! It may not come as a surprise that those flavours are available in the US, but not yet in Canada. In Peru, purple corn is a staple food, so it only seems natural that you can purchase purple corn-flavoured toothpaste on your trip to Machu Picchu. In Italy, those who cannot wait to get to the kitchen for their first caffeine shot of the day can freshen up with coffee flavour. Australia offers tea tree oil paste, and New Zealand has given us Propolis (bee resin) toothpaste (not sure whether that one prevents cavities or causes them!). India, of course, has curry flavour (wouldn’t one brush their teeth to get rid of the curry aftertaste?). India also has the milder and more palatable pomegranate toothpaste. For those who like a little ‘kick,’ there are plenty to choose from, including Scotch, bourbon, amaretto and crème de menthe. 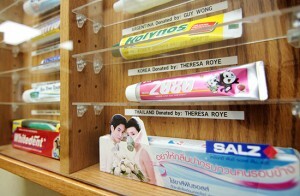 No country, though, has cornered the market on unusual toothpaste flavours like Japan. There you can purchase eggplant, charcoal (yes, it is a very unappealing shade of black), aloe, and of course, octopus-flavoured toothpaste.